When I got my Brother SE400, it had so many functions and features that I was a little bit overwhelmed. So I wanted to start with the easiest, simplest possible thing just to try out the embroidery. I decided to start with one of the built-in designs – the large, fancy initial “A”. A for Audrey, the name of my baby grandniece. I choose the easiest fabric I could think of – a medium weight, cotton twill – that would be easy to hoop, not too heavy and not stretchy. I used Sulky Soft ‘n Sheer, cut-away lightweight stabilizer behind the fabric and hooped both of them. This video of that first embroidery shows how to select the pattern and stitch it out. The embroidery came out very well. But there’s a lot more to learn. This is also my first video about my new Brother SE400 Sewing and Embroidery machine. I shot it with my iPhone 4s and edited it with iMovie on the iMac. Amazing how good the iPhone camera is now. 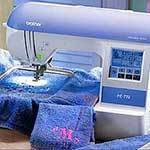 Reliable, feature-rich, and budget-friendly, the SE400 delivers both a full range of sewing features, and the ability to embellish home decor, clothing and gifts with its included 4 embroidery capabilities. Reliable, feature-rich, and budget-friendly, the SE400 delivers both a full range of sewing features, and the ability to embellish home decor, clothing and gifts with its included 4″x4″ embroidery capabilities. I can’t seem to do a 3 initial monogram one letter at a time on my Brother SE400. Do you have tips on how to size each letter individually and still have a pretty 3 letter monogram? Is there a way on the Brother SE400 to do a 3 letter monogram in one file? Thank you! Hello All, My problem is basic as it gets….I cannot seem to wind thread on the bobbin that comes with the machine. It keeps winding beneath the cutter. Any advice? There is a facebook group called Brother SE400 for Beginners that you all could try out for answers. I just got a SE400; the top thread won’t pull through; I know the logical thing is that the upper thread is not properly threaded but I can see the take up lever and the thread is through it; there are no error messages; I can pull the thread through the needle manually. The piece of work looks perfect on the back side but the front looks thin and obviously is just the bobbin thread pulled through . Any ideas? I have an se400 and the power went out. I was in the middle of the design I was working on. fortunately it was just finishing up one side of a butterfly. How do I continue with my design? It shows the design at the start of the design again. Just got my SE400 for Christmas, very excited! My problem is, when attempting to monogram 3 letters, they seem to pull the cloth around them as if they are too tight, help? try adjusting the tension, that should help. test it out on a scrap piece of material first. HELP! I just bought an SE400. My problem is I can’t figure out how to line things up, for example, I want to type 2 words on the same line. When I line the 2nd word up the carriage starts sewing somewhere else. I also have downloaded some design frames and I want to put initials inside the frame but I’m having a hard time trying to figure out how to fit the initials inside the frame. Thank you!! I’m new at this. I’m making memory bears and pillows and would like to be able to embroidery a poem on my pillows and need to know how to do that I have an SE 400. I’m searching very hard on a tutorial on how to. I do love to hear from you, and I’ll answer your comments as quickly as I can. But if I’m traveling or otherwise away from the computer, it could take me a few days.